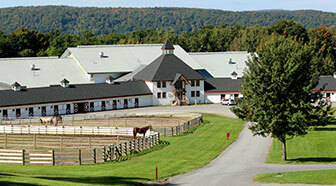 American Riding Instructor's Certification Program (ARICP) testing will be offered on Saturday, March 9, at the Cazenovia College Equine Education Center on Woodfield Road in Cazenovia. Certification recognizes teachers of horseback riding who instruct their students in a safe, knowledgeable, and professional manner. ARICP certification is an important aspect of an instructor's career and requires that candidates make it a priority. ARICP certification is meant for the serious, above average instructor who teaches safely and in a professional, competent manner, with high standards of honesty and integrity. It is offered for three levels of experience and in 16 teaching specialties. To ensure that ARICP-certified instructors' standards remain high, re-certification is required every five years, giving instructors an opportunity to upgrade their levels of certification and add new teaching specialties. Minimum age and experience requirements apply for each level of certification. Professor/Head Equestrian Team Coach Amy Sherrick-von Schiller is a Level III ARIA-certified instructor in both Hunt Seat and Show Jumping, as well as an ARIA-certified test center administrator. She conducts test centers at the college every year and may be reached at 315-655-7105 for more information. For fee and registration information, please visit the ARIA website at www.riding-instructor.com.